A’A to Marie Hall! Now. 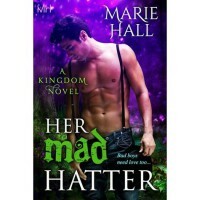 I was pissed off when Alice DIDN’T choose Hatter in the movie. I’m just saying, that’s a life with Johnny Depp, who played an amazing, lovable Hatter, or go back home to go into…trade? Um, duh no thought on that one. Bring on Hatter! Since I didn’t get my ending (still I LOVED the movie) I could not pass this book up. Not by a long shot. I absolutely loved this novel. She needed him just as much as he needed her. Go Danika on getting #1 Bad Boy matched. And Marie, I was already reading the next one that quick I had to remind myself to write the review. That’s the makings of a great series to me. Oi! Rock on, Auntie!